KiddiKutters - Kid-friendly knives for children to use in the kitchen. 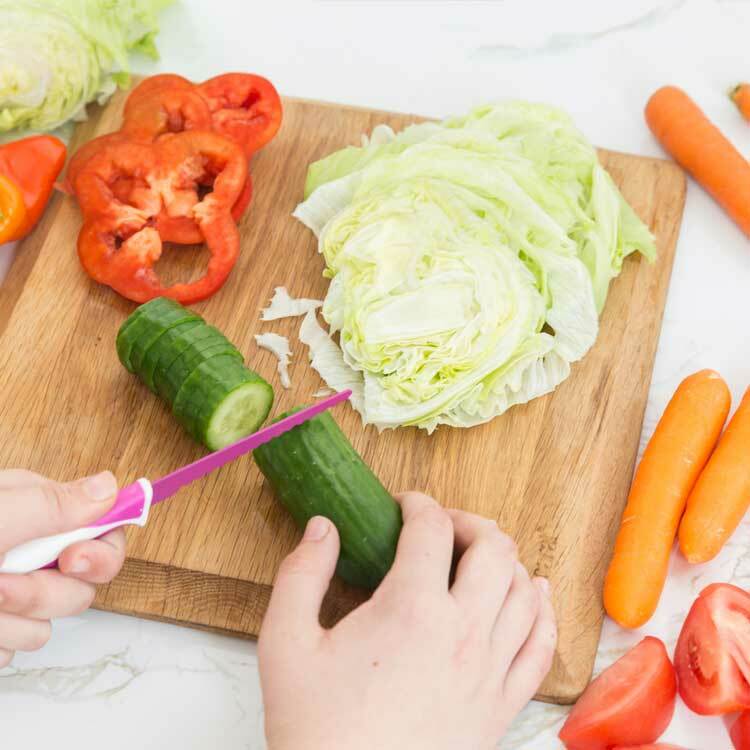 Children will love cutting up their own food and preparing fruit and vegetables safely with these kid-friendly knives. Available in six funky colours, KiddiKutters are safe for children three years and above. They are also ideal for older children and people with disabilities. BPA-free, food-safe knives that won’t cut skin. BPA-free, completely food safe and hygienic. Great to use with an easy-grip handle and coated stainless steel blade. Kiddikutter knives work by using a sawing action. They are not sharp and they won’t chop, but they will allow children to slice and dice fruit and vegetables and cut up their food. Now you can let kids as young as three help you in the kitchen without worrying about cuts and injuries. 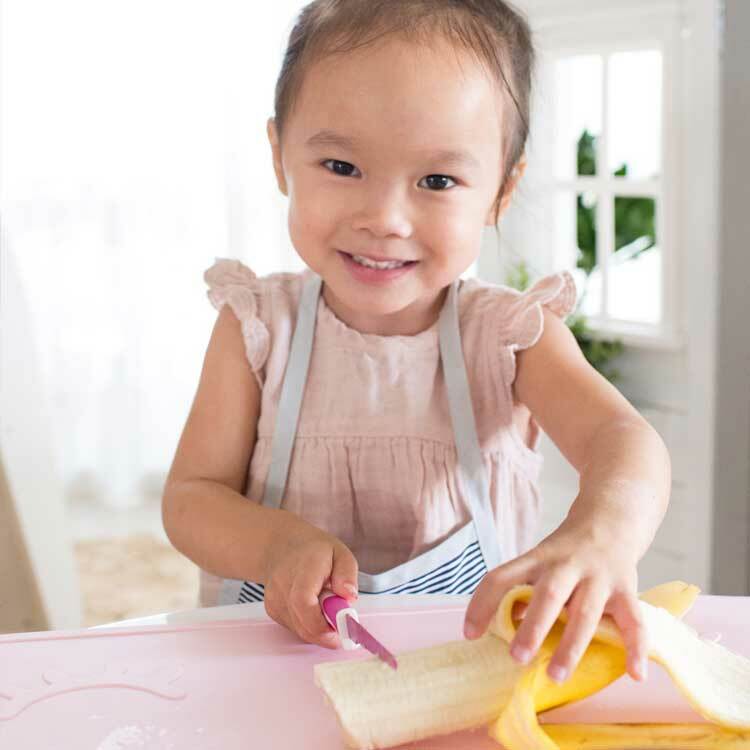 Using their own knife, children will learn and develop fine motor skills, and when you let them into the kitchen, you can teach them about food and nutrition and they are likely to want to try new fruits and vegetables along the way. Kiddikutters are handy for carrying in your nappy bag so you’re well equipped at snack time, and are ideal for use in cookery classes at schools and kindergartens. Create your own refreshing frozen treats this summer. The kids will love making some homemade ice pops packed full of healthy fruits for a summer time treat. Also, a great option for adults, to freeze your favourite drink, perhaps a Margarita or an Irish Coffee. Or simply mix up some fresh herbs and olive oil and save in the freezer for a later date. "Just received my KiddiKutter’s and I am very impressed! My kids have been proudly practicing their cutting skills and showing anyone who comes by that they don’t cut skin! I have tried a similar product before but it has nothing on these in both design, make and cutting ability. We love them so much we are getting more." "Love Love Love the Kiddikutters! As an educator and a Mum I always encourage the children in the kitchen but my knife phobia had me cringing and jumping at every turn! Thanks to Kiddikutter my children can be so much more independent in the kitchen and I don't have to worry about any accidents!" "Both of my younger children have used the Kiddikutters for a few years. They are great for them for have their own independence and peace of mind for me that they are safe while using them and not going to hurt themselves. They are fantastic quality and still cut with no problems after years of use." "I have given the grandkids the kid kutter knives they are fabulous for getting them hands on in the kitchen and you don’t have to worry they will cut themselves"
"Great for supporting a child’s independence. Allowing them to help prepare their own food using a sawing action. Our children love them."